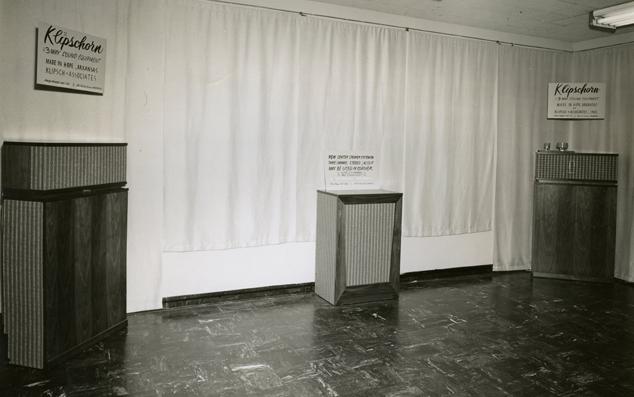 In 1957 Paul Klipsch had designed the Heresy speaker specifically to be a center channel between two Klipschorns. This was patterned after the teachings of Bell Laboratories of 1933. He soon realized that a larger, full-range speaker would be more appropriate for this center application. Thus the Cornwall is likely to be the world's second commercially produced center channel speaker. The Klipsch Cornwall was designed in 1959, with the first production unit shipping in October of that year. The design concept was to make a three way loudspeaker using a proven tweeter/midrange package and couple it with a vented direct radiating woofer cabinet. The latter was influenced by the work of Jensen's Jim Novak, and preceded Neville Thiele's work by two years. In the mid-seventies, Don Keele was working at Klipsch and measured the Cornwall against the then-accepted Thiele/Small parameters. It was within 4% of the lowest distortion standard alignment. The Cornwall was debuted at the Audio Fair in New York flanked by two Klipschorns. The sign above it stated that it was a speaker which could be used either in a corner or against a wall. It was un­named and suggestions for a name were solicited. Ultimately his first wife, Belle Klipsch, suggested "Corn-wall" to coincide with its dual purpose. The first tweeter used was the relatively new Electro Voice T-35. This remained until the Cornwall II was introduced in the early eighties. The First midrange driver was the University SAHF, but was displaced by a customized Atlas driver (K-55-V) "sporadically" over the next two years. The original midrange horn was a K-1000 (1000 Hz) diffraction horn. This was replaced with the standard 600Hz exponential horn (K-600) in January 1963. The first woofer was an Electro Voice 15WK that also was soon displaced by a custom Jensen (K-33-J). Later, CTS and Eminence woofers were employed. The Cornwall was available in several configuration options during its first 10 years of production. These included left and right vertical orientations, left and right horizontal orientations, and a variety of riser base options. The Cornwall II*, introduced in June of 1959, maintained the same low frequency driver (Eminence) and cabinet design. The primary change was a new exponential tweeter horn/driver combination and a new midrange driver. The tweeter afforded extended response and an improved polar pattern. The midrange driver was primarily a ''transparent" cost reduction, since the earlier driver was the same as that used in the Klipschorn, and as such, had to be padded down significantly to match the Cornwall's bass system. During 1981-1983, the midrange driver went through three major variations. The K-51-V and K-55-G were ceramic magnet versions (two vendors) of the Atlas K-55-V. The "final" version was a Heppner K-52-H. However, this was soon replaced with a Klipsch-built clone, the K-52-K. Obviously these tweeter and midrange changes required corresponding crossover network changes. The total result of all variations was essentially the same, and provided significantly smoother, extended frequency response. Additionally, the horns and woofer were flush-mounted into the baffle to slightly reduce diffraction effects. * By 1981 it was forgotten that the “original Cornwall II” occurred in 1963 when the K-1000 horn was replaced with the K-600 horn. Same thing with the Heresy, so we have had two II’s in both models!